Fundraiser by Abby Rhodes : Please help post flood! On Monday the 13th of August 2018, my grandmother was sitting in her finished basement watching TV when she heard my Pop-pop (grandfather) yell down to tell her to come upstairs because the neighbors had called letting them know that the rain was soon about to take over their house. She had gotten up just in time to not get knocked down by the water breaking the door down and busting into her house. 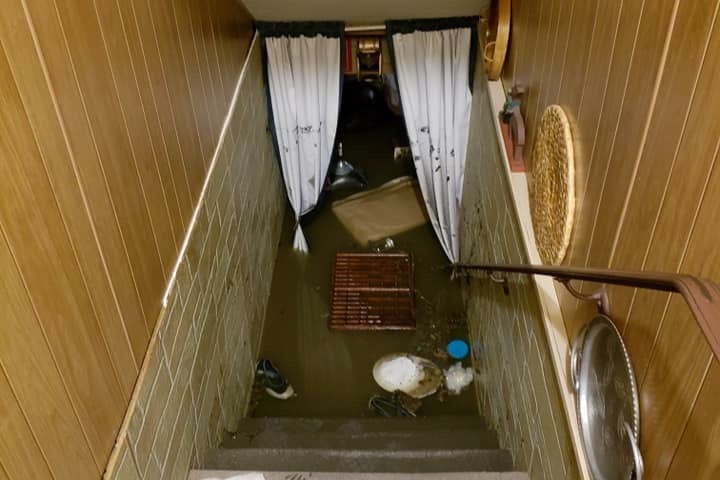 The rain continued almost all night and left my grandparents with a basement full of water to the ceilings of the basement. The basement is where we'd spend Christmas every year and it was where I'd hang out with them to watch TV. In the basement, my Pop-pop had his desk with computer and printer. He ran a small business with that to keep him busy, it was something he really enjoyed to do. It also had 2 closets full of stuff ranging from some papers to clothing to cooking appliances, anyone who knows my grandparents know that they love to cook together and always have. It was a fully furnished basement with TV also. The second room in the basement held the washer & dryer, and all of my grandfathers tools. Under the deck was also flooded, and ruined a couple tables, tools, etc. When we finally got the 8 ft of water out of the house, we found everything out of place, and everything absolutely destroyed. The ground, the wall, the furniture, EVERYTHING was covered in mud, and was SOAKED. When I went down to see them and to help out, I expected them to be in the worst mood, but they were actually being good sports about the situation despite losing a lot of their belongings. They tried to remain positive, but this was easy to change when they got a call from their insurance company. Their insurance informed them that they would not be covering a dime of the damages due to the flood. Putting this into perspective is when it becomes a harsh reality. They have tenants next door who they have to take care of too. They have to buy two water heaters which start at about $1,000 each. Furnances are each about $4,000 (after installation). They lost a washer and dryer also which is at least $1,000 to replace. On top of those costs, they lost everything they had bought for their home such as the TV, computer, furniture, & other basic necessities. Not only did they lose all these items they now have to pay for repairs, out of their own pocket costing $12,000, which this rate changes as more mold grows. The payments are extremely pricy, especially for people who are receiving absolutely no coverage from their insurance. The worst part about this situation is it could've been avoided. Since I've been young, my grandfather has been trying to reach out to the city's council to get the hole fixed in his backyard, that is the city's fault. The situation has been in papers and on the news for years because of all the attempts he made. The hole first started the size of a golf ball and grew to the size of a car, and yet nothing was ever done to help my grandparents. The night of the flood, the whole backyard caved in causing this flood for them. If the city had fixed it a year and a half ago like they were supposed to they would have never had this issue and having to deal with the impacts and distress it causes. After everything that has happened these past couple of days and seeing everything that was lost or what needs repair I thought it was best to make this fundraiser for them. I decided to start at $2,500 to help my grandparents out somewhat, and can adjust it as time goes on but this is a starting point. Please donate, any amount would help a great amount and would be super appreciated. Also, please share this so others can see and share it too. Thank you!